A 6.1R arrived late yesterday on the eve of Mercury Station, has shaken southern Costa Rica near the border with Panama on Friday evening, toppling items from store shelves and knocking out power in places, but authorities said there was no major damage or reports of serious injuries. The US Geological Survey said the magnitude 6.1 quake struck. at a depth of about 19 kilometres. Its epicentre was about 19 kilometres north of the town of Golfito. 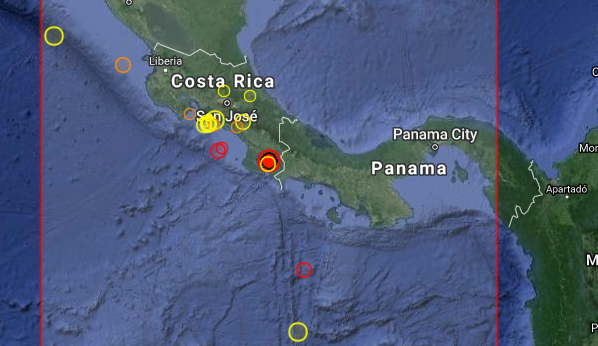 The USGS initially estimated the magnitude at 6.0. Ellery Quesada, a journalist with Channel 9 in Palmar Norte, near the epicentre, told The Associated Press that the quake was felt strongly in the region, some power poles had reportedly toppled and several aftershocks were felt afterward. In neighbouring Panama, civil defence officials said via Twitter that the quake was felt strongly in the border provinces of Chiriqui and Bocas del Toro but no damage had been detected.